It allows us to control the logging activity from an external configuration file. It can be in for of a properties file or XML. One can publish logging information to any level of granularity based on the code invoking it. It is capable of publishing logging information to various destinations such as files, consoles, even JMS and database. Finally, it is highly scalable as it allows developers to enhance the capability of logging by creating new logging destinations and unique formats and layouts. In this example, I am using log4j version 1.2.7. We need to add the dependency to our pom.xml. We will configure lo4j properties using the key value format. Before we start configuring lo4j, let’s understand the three important layers involved. Logger – The Logger object is responsible for capturing logging information. Logger objects are stored in a namespace hierarchy so if one wants each Logger object can be configured differently. Appender – The Appender object is responsible for publishing logging information to the preferred destinations. Each Appender object will have at least one target destination attached to it. Layout – The Layout object is used to format logging information in different styles. log4j.rootLogger is the root logger. The rootLogger is the father of all appenders. Each enabled logging request for a given logger will be forwarded to all the appenders in that logger as well as the appenders higher in the hierarchy (including rootLogger). 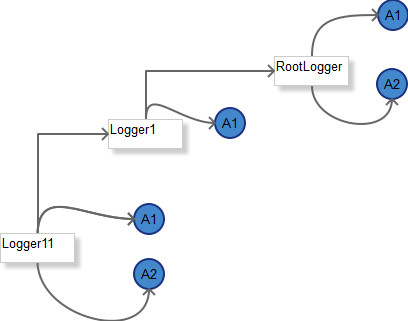 If Logger11 is child Logger1 which in turn is child of RootLogger, any logging request for Logger11 will be forwarded to Logger1 which in turn will forward it to its parent the RootLogger. In our example, we have set one Logger for each package. The Appender object is responsible for publishing logging information to various preferred destinations. Each Appender object will have at least one target destination attached to it. 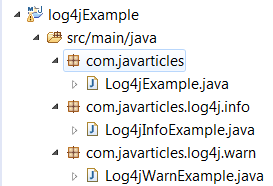 In our example, we are using org.apache.log4j.FileAppender and org.apache.log4j.ConsoleAppender. Level defines the granularity and priority of any logging information, for example, OFF, DEBUG, INFO, ERROR, WARN, FATAL and ALL. First we will configure the RootLogger. We will set its level to INFO level and assign couple of appenders file and console. These are just names. You can use any name you want. Next, you need to assign an appender and layer implementation to the logger. You can also assign a format for the message. %d will be filled with the datetime. %p will be filled with the priority code. %F will be replaced with the file name. %L is the line number. %m is the actual message and %n is the line separator. Note that the message repeats as we multiple loggers and each logger consumes the requests as well as forwards the request to its parent.